Frankenstein as we know him, the grotesque monster that was created through a weird science experiment, is actually a nameless Creature created by scientist Victor Frankenstein in Mary Shelley's 1818 novel, "Frankenstein." Widely considered the first work of science fiction for exploring the destructive consequences of scientific and moral transgressions, a new study published in BioScience argues that the horror of Mary Shelley's gothic novel is rooted in a fundamental principle of biology. The co-authors point to a pivotal scene when the Creature encounters Victor Frankenstein and requests a female companion to mitigate his loneliness. The Creature distinguishes his dietary needs from those of humans and expresses a willingness to inhabit the "wilds of South America," suggesting distinct ecological requirements. Frankenstein concedes to this reasoning given that humans would have few competitive interactions with a pair of isolated creatures, but he then reverses his decision after considering the creatures' reproductive potential and the probability of human extinction, a concept termed competitive exclusion. In essence, Frankenstein was saving humankind. "The principle of competitive exclusion was not formally defined until the 1930s," said Nathaniel J. Dominy, a professor of anthropology and biological sciences at Dartmouth. "Given Shelley's early command of this foundational concept, we used computational tools developed by ecologists to explore if, and how quickly, an expanding population of creatures would drive humans to extinction." The authors developed a mathematical model based on human population densities in 1816, finding that the competitive advantages of creatures varied under different circumstances. The worst-case scenario for humans was a growing population of creatures in South America, as it was a region with fewer humans and therefore less competition for resources. "We calculated that a founding population of two creatures could drive us to extinction in as little as 4,000 years," said Dominy. Although the study is merely a thought experiment, it casts new light on the underlying horror of the novel: our own extinction. It also has real-word implications for how we understand the biology of invasive species. "To date, most scholars have focused on Mary Shelley's knowledge of then-prevailing views on alchemy, physiology and resurrection; however, the genius of Mary Shelley lies in how she combined and repackaged existing scientific debates to invent the genre of science fiction," said Justin D. Yeakel, an Omidyar fellow at the Santa Fe Institute and an assistant professor in the School of Natural Sciences at the University of California, Merced. "Our study adds to Mary Shelley's legacy, by showing that her science fiction accurately anticipated fundamental concepts in ecology and evolution by many decades." 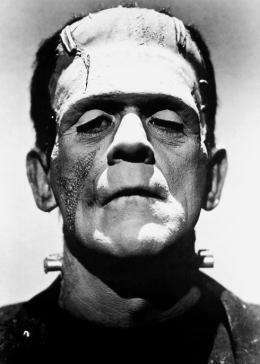 But - Monster Frankenstein and his bride were pieces of humans cobbled together. Wouldn't they still be - human? But don't we need to include the rest of the ecology of South America? The Americas had almost no beasts of burden, and geographic features didn't support the widespread latitudinal contact between cultures that Eurasia had. Those are among explanations I commonly see for technological civilization developing so much farther that the eventual European invaders were able to rapidly conquer American native peoples. And the invaders would still have brought diseases capable of decimating naive Frankensteinians, while the European peoples might have an advantage against new world diseases due to their much higher numbers. It seems like a very fertile topic for speculation though.